The Souljazz Orchestra in Montreal or Quebec City? Inform me about the next events for The Souljazz Orchestra. Enroll yourself to our priority waiting list for The Souljazz Orchestra to be alerted when new tickets are available. Filling this form doesn't engage you to any purchase. The Souljazz Orchestra is originally from Ottawa. Since their debut, they've toured the world with their music. 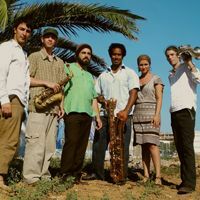 Pierre Chrétien, Marielle Rivard, Ray Murray, Philippe Lafrenière, Steve Patterson and Zakari Frantz are all the members of the band. They just launched their seveth album, Resistance, in 2015. The Souljazz Orchestra will be at Le Cercle in Quebec City in November 2015.